During the development of software, there can be many stages until it's ready for public consumption. You sure want to first test your code and then deploy it in a testing or staging environment before you release it to the public. That way you can prevent bugs not only in your software, but in the deployment process as well. 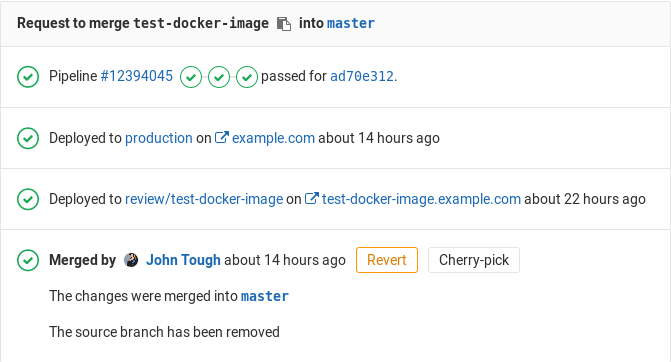 GitLab CI is capable of not only testing or building your projects, but also deploying them in your infrastructure, with the added benefit of giving you a way to track your deployments. In other words, you can always know what is currently being deployed or has been deployed on your servers. With environments, you can control the Continuous Deployment of your software all within GitLab. All you need to do is define them in your project's .gitlab-ci.yml as we will explore below. GitLab provides a full history of your deployments per every environment. Environments are like tags for your CI jobs, describing where code gets deployed. Deployments are created when jobs deploy versions of code to environments, so every environment can have one or more deployments. GitLab keeps track of your deployments, so you always know what is currently being deployed on your servers. If you have a deployment service such as Kubernetes enabled for your project, you can use it to assist with your deployments, and can even access a web terminal for your environment from within GitLab! Let's see how it all ties together. script: echo "Building the app"
- echo "Deploy to staging server"
The jobs assigned to these stages will run in this order. If a job fails, then the jobs that are assigned to the next stage won't run, rendering the pipeline as failed. In our case, the test job will run first, then the build and lastly the deploy_staging. With this, we ensure that first the tests pass, then our app is able to be built successfully, and lastly we deploy to the staging server. The environment keyword is just a hint for GitLab that this job actually deploys to this environment's name. It can also have a url which, as we will later see, is exposed in various places within GitLab. Each time a job that has an environment specified and succeeds, a deployment is recorded, remembering the Git SHA and environment name. Note: Starting with GitLab 8.15, the environment name is exposed to the Runner in two forms: $CI_ENVIRONMENT_NAME, and $CI_ENVIRONMENT_SLUG. The first is the name given in .gitlab-ci.yml (with any variables expanded), while the second is a "cleaned-up" version of the name, suitable for use in URLs, DNS, etc. Note: Starting with GitLab 9.3, the environment URL is exposed to the Runner via $CI_ENVIRONMENT_URL. The URL would be expanded from .gitlab-ci.yml, or if the URL was not defined there, the external URL from the environment would be used. All branches will run the test and build jobs. When a merge request is merged, all jobs will run and the deploy_staging in particular will deploy our code to a staging server while the deployment will be recorded in an environment named staging. Let's now see how that information is exposed within GitLab. The environment list under your project's Operations > Environments, is where you can find information of the last deployment status of an environment. Here's how the Environments page looks so far. While you can create environments manually in the web interface, we recommend that you define your environments in .gitlab-ci.yml first. They will be automatically created for you after the first deploy. The environments page can only be viewed by Reporters and above. For more information on the permissions, see the permissions documentation. Only deploys that happen after your .gitlab-ci.yml is properly configured will show up in the "Environment" and "Last deployment" lists. The information shown in the Environments page is limited to the latest deployments, but as you may have guessed an environment can have multiple deployments. GitLab keeps track of your deployments, so you always know what is currently being deployed on your servers. That way you can have the full history of your deployments per every environment right in your browser. Clicking on an environment will show the history of its deployments. Assuming you have deployed multiple times already, here's how a specific environment's page looks like. We can see the same information as when in the Environments page, but this time all deployments are shown. As you may have noticed, apart from the Re-deploy button there are now Rollback buttons for each deployment. Let's see how that works. You can't control everything, so sometimes things go wrong. When that unfortunate time comes GitLab has you covered. Simply by clicking the Rollback button that can be found in the deployments page (Operations > Environments > environment name) you can relaunch the job with the commit associated with it. Note: Bear in mind that your mileage will vary and it's entirely up to how you define the deployment process in the job's script whether the rollback succeeds or not. GitLab CI is just following orders. Thankfully that was the staging server that we had to rollback, and since we learn from our mistakes, we decided to not make the same again when we deploy to the production server. Enter manual actions for deployments. - echo "Deploy to production server"
The when: manual action exposes a play button in GitLab's UI and the deploy_prod job will only be triggered if and when we click that play button. You can find it in the pipeline, job, environment, and deployment views. Clicking on the play button in either of these places will trigger the deploy_prod job, and the deployment will be recorded under a new environment named production. Note: Remember that if your environment's name is production (all lowercase), then it will get recorded in Cycle Analytics. Double the benefit! As the name suggests, it is possible to create environments on the fly by just declaring their names dynamically in .gitlab-ci.yml. Dynamic environments is the basis of Review apps. NOTE: Note: The name and url parameters can use most of the CI/CD variables, including predefined, project/group ones and .gitlab-ci.yml variables. You however cannot use variables defined under script or on the Runner's side. There are also other variables that are unsupported in the context of environment:name. You can read more about where variables can be used. - echo "Deploy a review app"
Let's break it down in pieces. The job's name is deploy_review and it runs on the deploy stage. The script at this point is fictional, you'd have to use your own based on your deployment. Then, we set the environment with the environment:name being review/$CI_COMMIT_REF_NAME. Now that's an interesting one. Since the environment name can contain slashes (/), we can use this pattern to distinguish between dynamic environments and the regular ones. So, the first part is review, followed by a / and then $CI_COMMIT_REF_NAME which takes the value of the branch name. Since $CI_COMMIT_REF_NAME itself may also contain /, or other characters that would be invalid in a domain name or URL, we use $CI_ENVIRONMENT_SLUG in the environment:url so that the environment can get a specific and distinct URL for each branch. In this case, given a $CI_COMMIT_REF_NAME of 100-Do-The-Thing, the URL will be something like https://100-do-the-4f99a2.example.com. Again, the way you set up the web server to serve these requests is based on your setup. Last but not least, we tell the job to run only on branches except master. Note: You are not bound to use the same prefix or only slashes in the dynamic environments' names (/), but as we will see later, this will enable the grouping similar environments feature. It is assumed that the user has already set up NGINX and GitLab Runner in the server this job will run on. Note: Be sure to check out the limitations section for some edge cases regarding naming of your branches and Review Apps. So now, every branch gets its own environment and is deployed to its own place with the added benefit of having a history of deployments and also being able to rollback changes if needed. Let's briefly see where URL that's defined in the environments is exposed. The environment URL is exposed in a few places within GitLab. If a merge request is eventually merged to the default branch (in our case master) and that branch also deploys to an environment (in our case staging and/or production) you can see this information in the merge request itself. With GitLab's Route Maps you can go directly from source files to public pages on the environment set for Review Apps. From then on, you have a full development cycle, where your app is tested, built, deployed as a Review App, deployed to a staging server once the merge request is merged, and finally manually deployed to the production server. This is a simple workflow, but when you have multiple developers working on a project at the same time, each of them pushing to their own branches, dynamic environments are created all the time. In which case, you probably want to do some clean up. Read next how environments can be stopped. By stopping an environment, you are effectively terminating its recording of the deployments that happen in it. A branch is associated with an environment when the CI pipeline that is created for this branch, was recently deployed to this environment. You can think of the CI pipeline as the glue between the branch and the environment: branch ➔ CI pipeline ➔ environment. There is a special case where environments can be manually stopped. That can happen if you provide another job for that matter. The syntax is a little tricky since a job calls another job to do the job. - echo "Remove review app"
Setting the GIT_STRATEGY to none is necessary on the stop_review job so that the GitLab Runner won't try to checkout the code after the branch is deleted. Note: Starting with GitLab 8.14, dynamic environments will be stopped automatically when their associated branch is deleted. When you have an environment that has a stop action defined (typically when the environment describes a review app), GitLab will automatically trigger a stop action when the associated branch is deleted. The stop_review job must be in the same stage as the deploy_review one in order for the environment to automatically stop. You can read more in the .gitlab-ci.yml reference. As we've seen in the dynamic environments, you can prepend their name with a word, then followed by a / and finally the branch name which is automatically defined by the CI_COMMIT_REF_NAME variable. In short, environments that are named like type/foo are presented under a group named type. 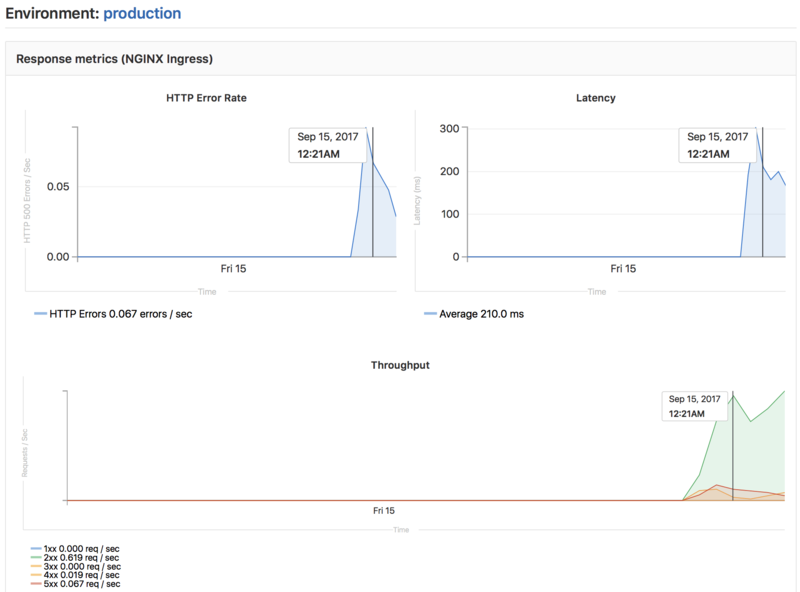 If you have enabled Prometheus for monitoring system and response metrics, you can monitor the performance behavior of your app running in each environment. Once configured, GitLab will attempt to retrieve supported performance metrics for any environment which has had a successful deployment. If monitoring data was successfully retrieved, a Monitoring button will appear for each environment. Clicking on the Monitoring button will display a new page, showing up to the last 8 hours of performance data. It may take a minute or two for data to appear after initial deployment. All deployments to an environment are shown directly on the monitoring dashboard which allows easy correlation between any changes in performance and a new version of the app, all without leaving GitLab. Note: Web terminals were added in GitLab 8.15 and are only available to project maintainers and owners. If you deploy to your environments with the help of a deployment service (e.g., the Kubernetes integration), GitLab can open a terminal session to your environment! This is a very powerful feature that allows you to debug issues without leaving the comfort of your web browser. To enable it, just follow the instructions given in the service integration documentation. This works just like any other terminal - you'll be in the container created by your deployment, so you can run shell commands and get responses in real time, check the logs, try out configuration or code tweaks, etc. You can open multiple terminals to the same environment - they each get their own shell session - and even a multiplexer like screen or tmux! Note: Container-based deployments often lack basic tools (like an editor), and may be stopped or restarted at any time. If this happens, you will lose all your changes! Treat this as a debugging tool, not a comprehensive online IDE. While this is fine for deploying to some stable environments like staging or production, what happens for branches? So far we haven't defined anything regarding deployments for branches other than master. Dynamic environments will help us achieve that. Since 8.13, a reference in the git repository is saved for each deployment, so knowing the state of your current environments is only a git fetch away. You are limited to use only the CI predefined variables in the environment: name. If you try to re-use variables defined inside script as part of the environment name, it will not work.